we had a BQ today my son and grandaughter went swimming and after that thought we would take pictures and this what came out in the picture. 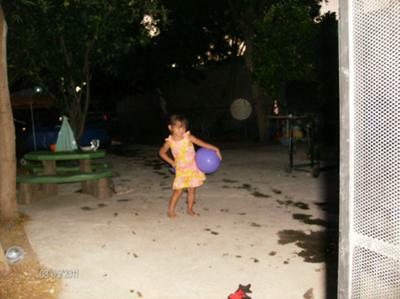 If you look on the left side of her you will see a big orb? White and round with a eye in the middle. Tell me what you think! The 'orb' is likely something on the lens that is catching light. It looks like that because it's out of focus.